I have been called both crazy and insane this weekend as I’ve shared the photos on Facebook and Twitter while putting this top together. I’d have to agree. Even though it hasn’t been quilted and bound yet, I have no doubt this will be my favourite quilt for many years to come. I think they multiply as I sleep! I’m going to have to come up with another pattern for using these up, but that’s for another year!! Fabulous post! 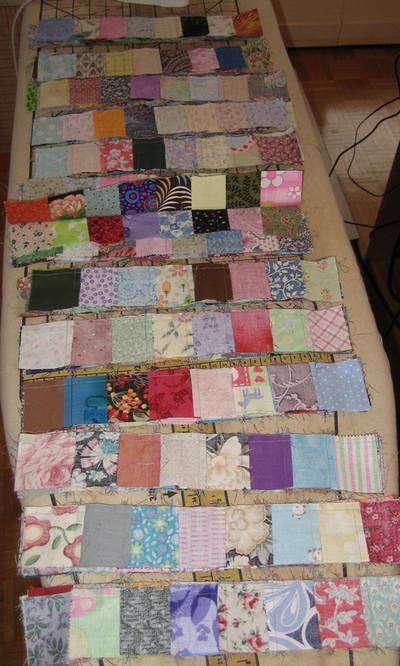 I love scrap quilts especially simple ones. 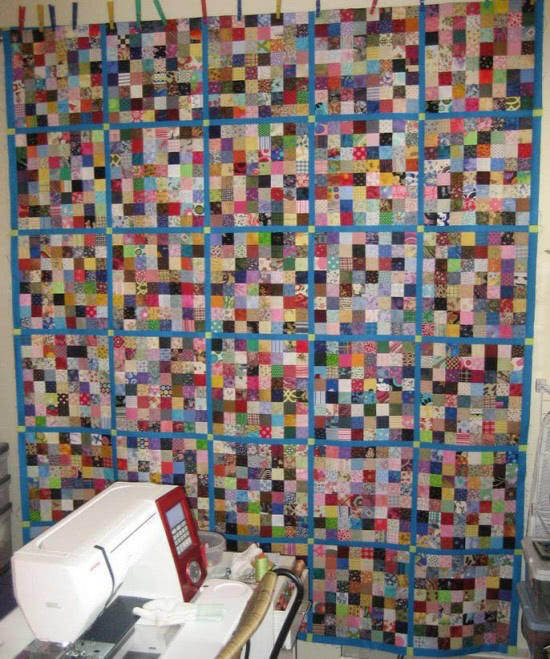 WOW…love it..and that’s a lot of work for sure….amazing work Michelle…I so love scrappy quilts….. Your quilt is fabulous!!! The blue sashing really sets it off. I’ve been wanting to make one of these for a long time. Thanks for sharing the pictures. Looks fabulous! What are you going to do with the rest of the squares? A matching one :) Congratulations!!! Wow, you have so much patience for these little squares. 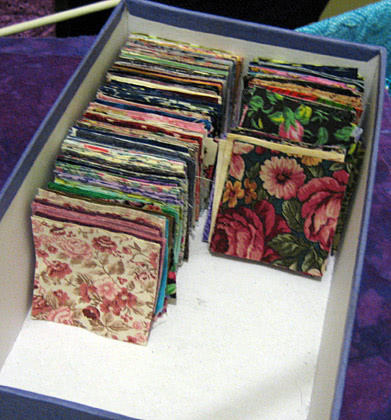 The quilt shows real beauty though and I can see why it would be your favorite. Thank you for the instructions. What a lot of work! I think it really will end up being one of your favorites ever! Absolutely lovely quilt. 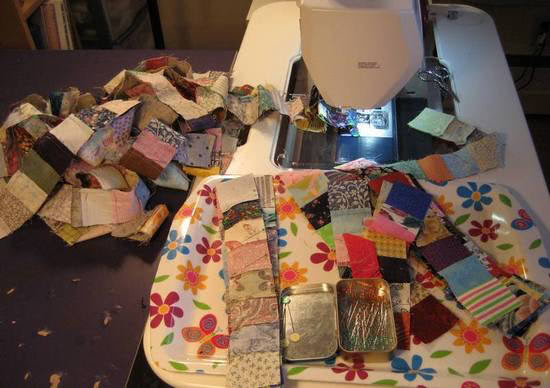 Very inspiring, although it might take me some time to do enough sewing to have enough scraps to make up THAT many small squares. Can’t wait to see the finished quilt. Hi I love the quilt. I making one just like it out of the same size blocks. It is all scrappy too. 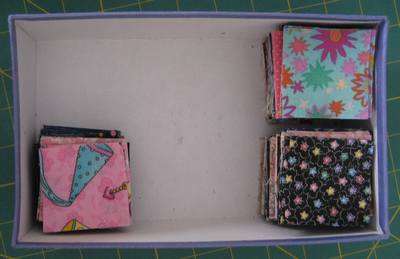 I keep cutting and sewing too. So many squares. It looks amazing!! I don’t think that your are crazy or insane ; it’s gorgeous and you are artisitc !! ( there is a fine line between the 2 sometimes !!! ) I love postage stamps quilts but feel I’ll never try one unless I make the stamps a lot bigger !!! Great work ; both sides are awesome , indeed !!!! Love the quilt! All of those squares make it so interesting, and you’ll have fun remembering the exchange everytime you look at your quilt. Wonderful indeed! FABulous quilt! What a great endeavor! Love it! Take care. Deb. Love your postage stamp! I just don’t have the nerve…or maybe it’s patience. Great job! They surely do multiply while we sleep. Still, quite an accomplishment here! This is definitely an heirloom that will be handed down for many many years. It’s just beautiful. Darn you for adding another “To do” on my list! What a fab way to use up all those scrappy bits of material, very inspiring. It looks great. 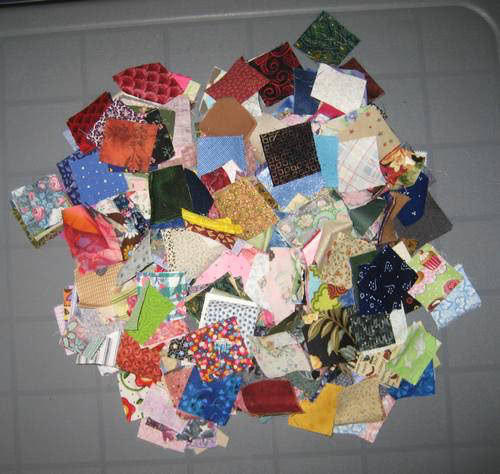 I’ve currently got several hundred – maybe even several thousand 2″ squares (haven’t counted lated). My plan is to make a hexagon quilt with them but I know I’ll have lots left over and so you’ve given me an idea of what to do next! I hadn’t thought of asking others for a contribution – what a great idea! 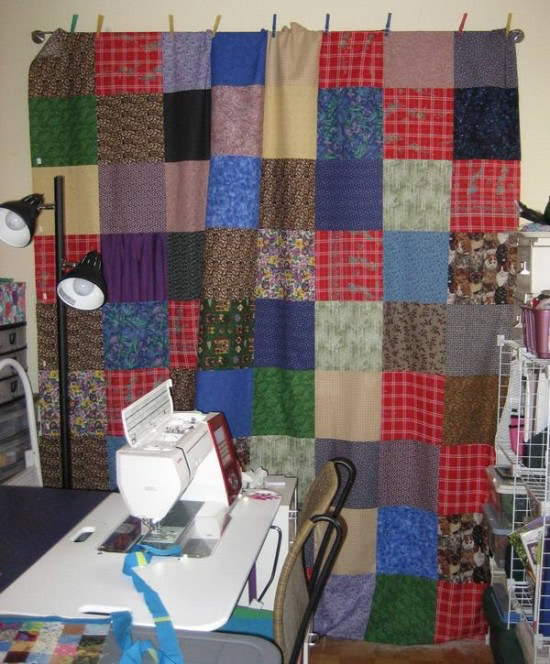 I love your postage stamp quilt! Well done, this is definitely a family heirloom!!! incredible !!! Looks like fun for a beginner, Could we do this for us folks that sign up for as newbys. 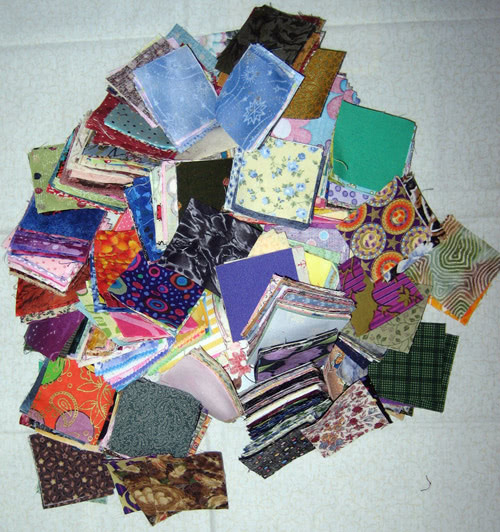 I have some fabric I will never do anything with but would love some squares. Wow! 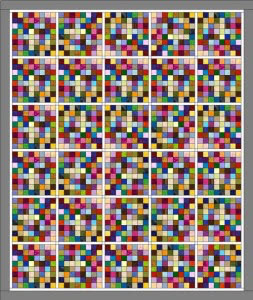 I saw this a few days ago and loved it, but didn’t realize all the squares came from other quilters! How special is that – wonderful! This will truly be your most priceless quilt. 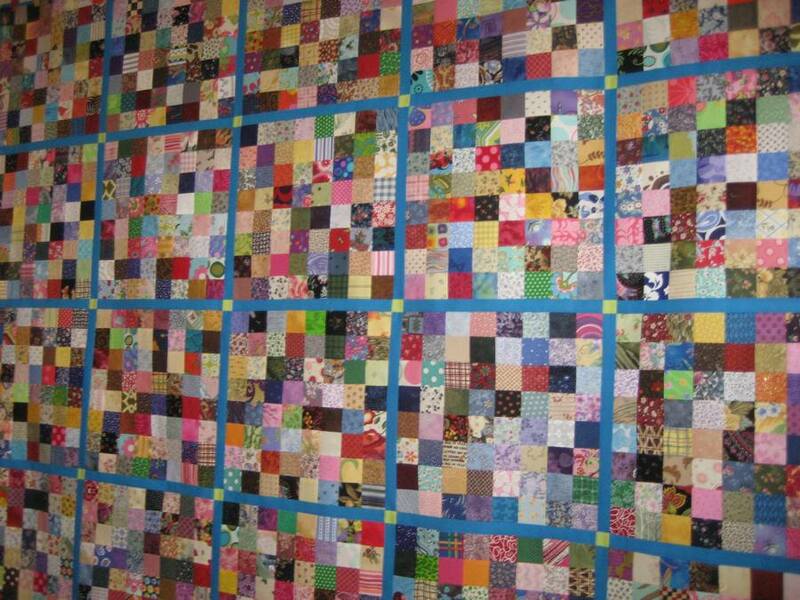 Thanks for sharing with others,I did make this quilt 2 years ago,when I was a co-ordinator of our quilt guild,everyone was giving me their leftover 2 inch squares,,What to do with them,.Community quilts,AND FIRE VICTIMS,.they were delighted with them.Again thanks for the reminder. I can’t even imagine all this time and work. Beautiful. Congratulations. 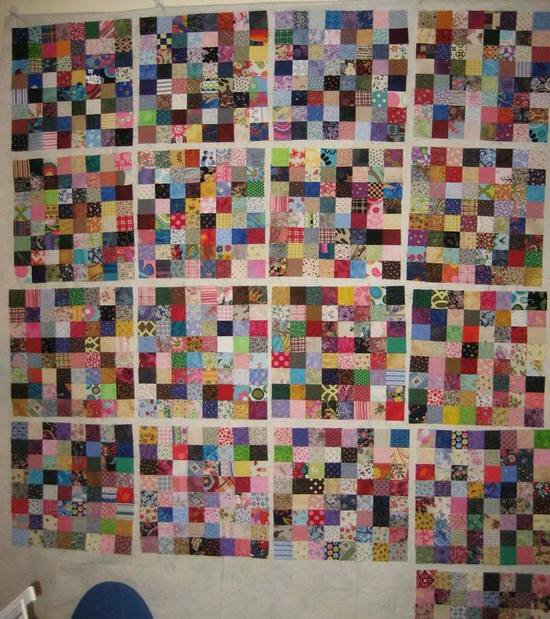 What a WONDERFUL quilt to lay under and just browse with your eyes the different patches. Did you know, when you go up and down and all around to focus on different things…you actually are doing an eye exercise designed to strengthen your eye muscles! Yes!! !